A reputed manufacturer and exporters of continuous cast and cold rolled Nickle silver, German Silver wires and flats for Zippers, Tooth Brushes, Zari & Optical frames. Nickel Silver Wires produced by SARU are of the highest quality exported world wide. Sizes available from 0.20 mm to 6 mm diameter. Sizes of flat wires available on request . We offer Nickel Silver Wire to our clients. 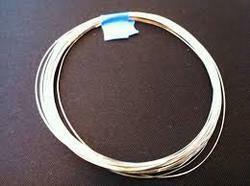 We are leading Manufacturer, Supplier & Exporter and we offer Nickel Silver Wires to our customers. 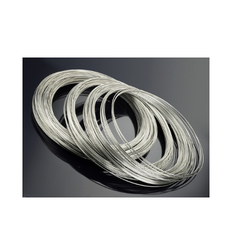 Owing to our in-depth knowledge in this domain, we are specialized in providing Nickel Coated Silver Wire. Nickel silver wire is a copper alloy with Copper, Nickel, Lead & Manganese . We offer a premium quality range of Nickel Silver Wire for Ball Pen Tip, which is acknowledged for its resistance corrosion, high strength and high conductivity. Due to our high-powered conductivity and Eddey current tests, we have been able to fabricate and export defect less range of nickel plated wire. All the wire rods are continuous cast with strict control on chemical composition. Wire rods are further drawn down to various sizes and tempers required with close tolerance. Maximum coil weight is 1000 kgs, available in spools or coils. Best machine is used for the manufacturing of this Nickel Silver Anchor Wire of premium quality. This anchor wire is light in weight and available in market in many thicknesses. Safe from water and rough weather condition, offered wires are quality tested by professionals before presenting in the market.